This post is sponsored by Cheerios. As part of our Back to School Basics series we are featuring activities that practice simple preschool concepts. Today's post focuses on quick fine motor activities that are fun for preschoolers, easy to set up, and help strengthen finger muscles. I'm partnering with Cheerios this month and am excited to share a bit about the sustainability of Cheerios, from the oats all the way to alternative uses for the product itself, like the boxes, which we love to create with! Did you know that all the boxes are made from 100% recycled paperboard? In addition to recycling our Cheerios cereal boxes, we love to upcycle the large paperboard boxes and craft with them. We are headed off on our last road trip of the summer next weekend, so I decided to make a few portable play boards for my kids using our Cheerios boxes. This way they'll have something fun to do while we are driving that is a little different from our last road trip a few weeks ago. 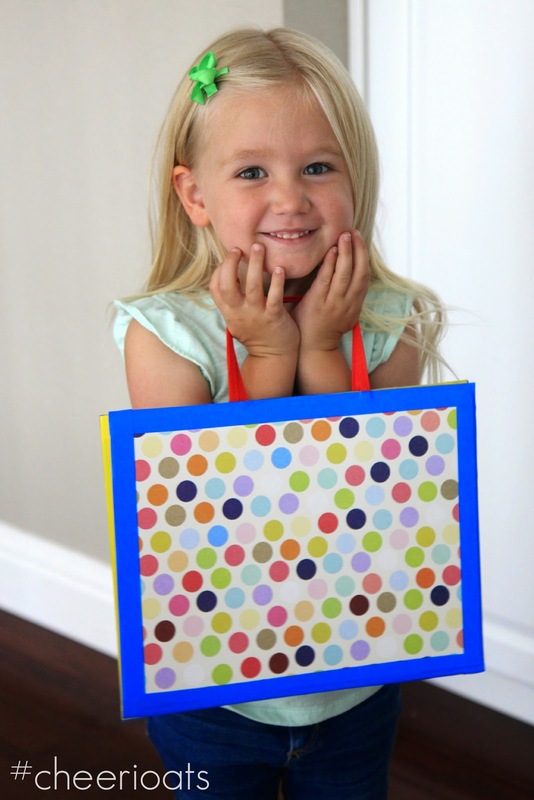 The Cheerios Box DIY Portable Play Boards were actually really quick to make and my kids had fun testing them out for me along the way to make sure they worked. This is a Mom Project but little helpers are welcome! One thing I love about these Cheerios boxes I bought was that they were very plain and not covered with games for kids or tons of writing. My kids loved the heart bowl on one side and the word "smile" on the other side. To start off our craft we broke the boxes down and then cut the covers into 9x12 (approx) sized sheets. For our first portable play board we decided to keep it really simple and we used the fronts of the boxes as decoration instead of covering them. Once they were cut down to size we taped a line of plastic colored tape down the center between the two boxes to create a spine. I taped each side down to bind the two pieces of cardboard together. Next I took a 8.5x11 piece of felt and laid it down on top of one cardboard side. Then I used the hot glue gun to secure it in place and then I added a tape boarder around the felt (and on top of the edge of it) to hold it in place. After I taped down the first side I got out the chalkboard magnet board, hot glued it in place, and then also added a yellow border around it to hold it in place. Next I took a piece of sturdy ribbon and secured it to each side of the box using tape. The ribbon created a handle on each side so that kids could carry the play board around with them or hang it up easily. One cool thing about the play board is that you can flip it to close back to back so that you can either have a chalkboard magnet board showing or turn it around and have a felt board showing. My kids immediately grabbed their magnets to start playing on the board! 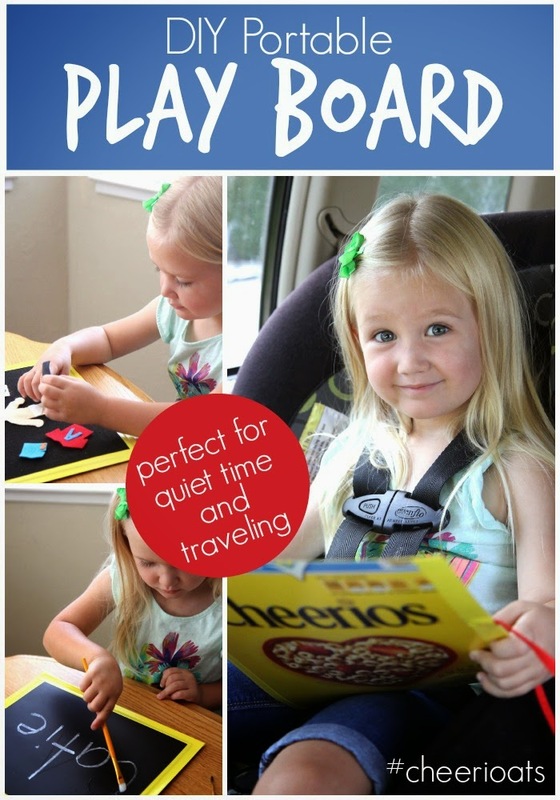 Since my preschooler doesn't nap any more, I've started using our portable play board for travel and also for during her daily quiet time. Usually she'll play in her room for about forty minutes and then will come out wanting something to do. Since I am usually busy doing projects, I have her play with this portable play board! She loves it! Below you'll find three simple play board activities we've enjoyed. 1. One of our favorite activities using the play board was to build felt ice cream cones. Click here for the full tutorial. Manipulating the felt and moving it around was great for my preschooler's fine motor skills and gave her an opportunity to explore colors a bit too. She enjoyed telling me which color was which and where it went while I was trying to work. 2. We also loved exploring with chalk and paint brushes! My daughter is really interested in her name and related activities, so I wrote it with chalk and then she used a paintbrush and water to trace the letters in her name and make the name disappear. We also just created pictures and other drawings and she magically erased them with water and her paintbrush. 3. For our third activity we played with felt people on our felt board. Have you ever made felt people? My friend Sarah made us an adorable set a few years ago and we have been loving it! The set was personalized for my son, so now I am excited to create one for my daughter. She loved playing with his set too. 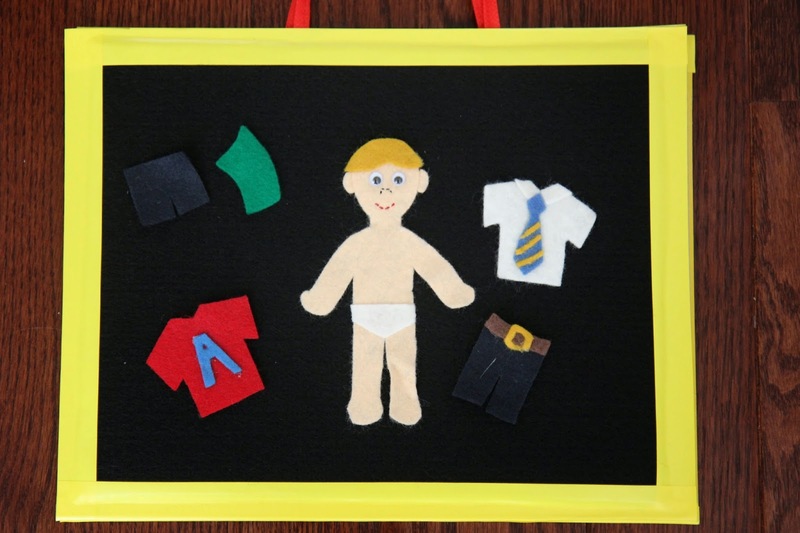 * I am including a free felt people printable with this post if you want to make your own felt people (and clothes)! Click here to download it. Just use these templates to cut out your own felt people & clothes. Mine are super simple but I am sure many of you could jazz these up a bit to make them even cuter! In addition to making one play board super simple with the Cheerios box picture on the front for my son, my daughter also helped me add some color to one play board for her. We used some favorite scrapbook paper and more plastic tape to cover the play board. My daughter was ecstatic that she had an entire play board just for herself and she spent a lot of time using it! As I make more felt stories we'll have to add them to our collection to play with during quiet time! It is so cool that we were able to make something so useful and fun from a box of Cheerios! Wish us luck on our road trip this week! I think our Cheerios box creation will be a big help! * Please Note: If you have super destructive kids then you may want to use a thicker ribbon or even fabric to make your handles thicker than mine. My kids were so excited to play with materials on the board that they weren't trying to destroy it. Have you made anything from a Cheerios box? Share about it in the comments! 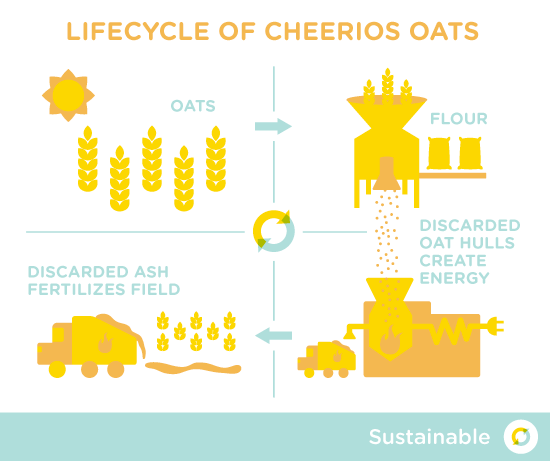 Did you know that not only are the Cheerios boxes sustainable, but the oats are sustainable too? Oats are among the most sustainable crops and usually require less fertilizer and pesticides than other major crops. They also typically rely entirely on rainfall – instead of irrigation – for water. This makes Cheerios good for us and also good for the planet! So awesome! You can read more about Cheerios Oats here and how they are used to help the earth! Check out Cheerios.com for more info about the Power of Oats AND see all of the other cool creations people are making with their cereal boxes! I especially love this Cheerios guitar from Made by Joel. If you want to check out our other Back to School Basics post, heading on over to our Back to School Basics landing page. Disclosure: This post is sponsored by Cheerios and General Mills. All opinions are mine. This is adorable!! :) So creative!! What great ideas. Thank you for sharing. Especially for those of us who are not DIY inclined. Where did you find the chalkboard magnet board? We are going on vacation in a couple of weeks and will be spending a fair amount of time in the car. Our daughter (almost 2) does pretty well on the plane but hasn't spent any significant amount of time in the car and this seems like it would be great! I'm not crafty but I think I can handle this. We purchased it at Michaels craft store. I was at Michaels today and wasn't able to find anything like the magnetic chalk board. I found big boards but not just a sheet. Is it like a sheet of paper that's a chalkboard and magnetic? Still hoping to be able to find something. Thanks! Hmm, it is like a sheet of paper, you'll find it by the magnets. Here's a link to it online that I just found. http://www.amazon.com/ProMag-Chalkboard-Magnet-8-5-Inch-1-Pack-/dp/B00JOT69VW/ref=sr_1_4?s=home-garden&ie=UTF8&qid=1421185566&sr=1-4&keywords=chalkboard+magnetic+sheets Hope that helps! !